Inventory We are a resale marketplace, not a box office or venue. Ticket prices may exceed face value. This site is not owned by Jacksonville Veterans Memorial Arena . 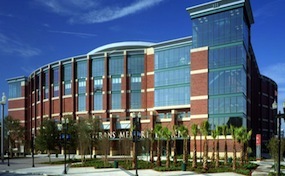 The Jacksonville Veterans Memorial Arena is a 15,000 seat multi-purpose arena in Jacksonville, Florida. It was built in 2003 as part of Mayor John Delaney's Better Jacksonville Plan to replace the outdated Jacksonville Memorial Coliseum. The arena was designed, using state-of-the-art techniques, to have the acoustical characteristics necessary for concerts; the first artist to hold a concert in the Arena was Elton John, in November 2003. Since that time, dozens of groups, including country, rap, rock and others have performed at the arena. In 2006, a scheduled Dixie Chicks concert was cancelled, due to lack of ticket sales, which was seen as part of the general backlash against the group's comments on the Iraq War, especially in the South. While box office will focus on concerts, other non-musical events will be hosted at the Jacksonville Arena, such as one-off sporting events such as UFC fights and rodeo events, non-profit and charitable events, family entertainment shows, and events hosted by the city and people of Jacksonville. JacksonvilleBoxOffice.com is not affiliated or associated with any primary box office, website, or official venue supplier. We are a privately owned company that concentrates in the resale secondary ticket market. Prices are controlled by demand and can be above or below face value. To order tickets to all Jacksonville Veterans Memorial Arena events please follow the process online.